Sami Zennaro will celebrate 100 Big V Games this Saturday night. Sami began as a Vike in the Under 12 rep program and still plays Under 20s, Youth League and Division 2 Women as well as assists one of our Under 12 girls teams. It's fair to say basketball and the Vikes are a bit part of her life. We caught up with Sami earlier in the week. Sami Zennaro: Thank you!! It’s pretty exciting but doesn’t really feel like it. It’s gone so fast!! SZ: My main highlight of my career is defiantly the USA Tour we just did in January/December. Where we won 8 out of 9 games and made some great friendships and memories along the way. SZ: in 2013 Adam Holden let me join the group and half way through the season I got a call up to make my debut. BV: And when did you start playing basketball? SZ: I started mozzies when I was about 4 and my first ever game of basketball was the next year. I always played ball in the backyard with my brother and sister once they had started so was really eager to join. BV: Is it true that under 12s was the best 5 years of your life? SZ: Hell yeaaaah!! Haha I was always on the sideline watching my brother and sister play and couldn’t wait to get involved… and finally I got a tap on the shoulder and asked to join the team being a seriously bottom aged player. BV: What made you start so early? SZ: Because my sister was playing rep I always loved going and watching and my parents always encouraged me to play. SZ: The president (He made me say that)… I especially love how it has such a great feel at the club and the family aspect. BV: What are the goals for the rest of your career? SZ: To play as long as possible and win as many championships as we can. SZ: Obviously I’d like to thank my parents for getting us involved in the game and especially this club. To all the coaches along the way that have helped me get to where I am. And also my family for understanding why Mandy and I are not at many family events anymore! SZ: Enjoy the game as long as you can. It’s so much fun and keep pushing and aiming to go far. BV: Thanks Sami and congratulations on reaching 100 games. 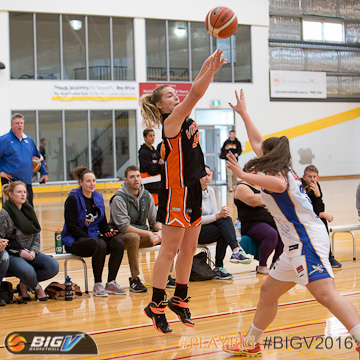 Sami will celebrate game 100 this Saturday night at 6.00pm at Knox Basketball Stadium against the Warrnambool Mermaids. Tickets are available at the door and are just $6 for adults and $3 for kids. Vikings juniors in their uniform are admitted free!